The DSUB Series of DIN rail mounted interface modules provides a reliable “plug and play” interface for any industrial control system. Users can attach field wiring from the terminal blocks to their industrial control panel and then simply plug in their controller. 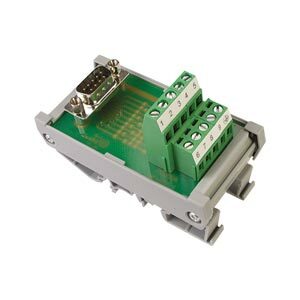 These modules come with both male and female D-sub connectors for maximum flexibility. 참고: Only dual-connector models are CE/CSA/UL rated. Hook Up Wire Irradiated PVC Insulation preffered wire for soldering applications; abrasion and cut resistant, used in military harnessing, medical electronics and power lead supply.